Adventures on land cont´d, a partial update from one of Brazil’s most spectacular parks | Surfer Grrrls Brazil! 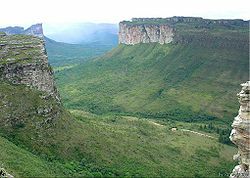 Chapada Diamantina, where I have spent the last 3 days! I was losing my mind a little bit by staying right next to the ocean and not being able to surf. So…. 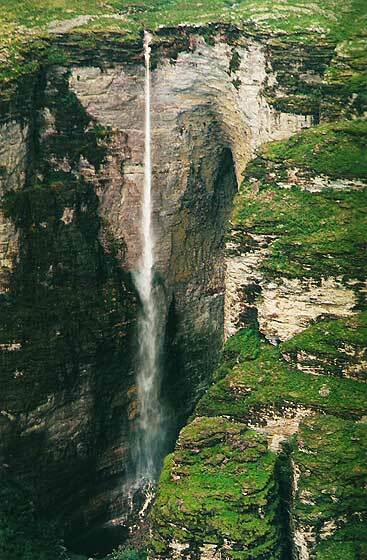 I decided to head to Chapada Diamantina, one of Brazil’s crown jewels in terms of natural beauty. Picture the land formations, mesas, and buttes of New Mexico, combined with tropical rain forests and waterfalls. Fumaca falls, which I sat at the top of yesterday! movies sometimes do, laid on the edge of a 400 meter cliff and looked down at another water fall, encountered a real live tarantula-esque spider, and walked up a dry river bed for many many miles in a tropical forest where we had to be quiet so as not to attract the killer bees. AWESOME!! Signing off from a little hole in the wall internet cafe where local kids come to play x-box, on a cobble stone street, in a town of painted pastel houses in the middle of a giant national park.